Hapag-Lloyd Cruises has announced that the two pillars of its future development will be luxury cruising and expedition voyages, while at the same time it will be looking to grow these sectors by expanding in the English-speaking market. The newbuilding Europa 2, to be introduced in May 2013, and fleetmate of the existing Europa, will be aimed at the 5-star luxury sector. And, in addition to the existing expedition ships Hanseatic and Bremen, new growth opportunities will be sought in the expedition sector. Hapag-Lloyd Cruises is already known in German-speaking countries as one of the leading operators in the luxury and expedition sectors. And at the same time, the proposed expansion into international markets will go hand-in-hand with this focus on luxury cruising in these two sectors. “By consistently focusing on these two pillars, we strive to enhance further our strength and our leading position as regards quality in these segments and at the same time we will address new markets“, explains Dr. Wolfgang Flägel, managing director of Hapag-Lloyd Cruises. Selected cruises aboard all ships in the present fleet except for Columbus 2 are already marketed internationally. But Flägel added that “with Europa 2, we will put into service a ship designed to offer an international flair and address a sophisticated, cosmopolitan target group, planning in future to increase market share in English-speaking countries such as the USA, UK and Benelux.” The first English-language Europa 2 brochure is released this week. As a result of this new strategy, Hapag-Lloyd’s charter on Columbus 2, which concentrates on the German-speaking four-star market, will not be extended when it expires in April 2014. Hapag-Lloyd took over Columbus 2 this May and has been operating her under bareboat charter from Oceania Cruises, where she had been operated as Insignia. It will be interesting to see if these decisions bring Hapag-Lloyd Cruises back into the mainstream of world cruising, where for many years its ships attracted a large English-speaking clientele. Hapag-Lloyd’s Bremen (right) and German Atlantic Line’s Hanseatic were considered amongst the best ships on the North Atlantic fifty years ago. Equally, to-day’s product is one of the best in the cruise market and its attraction is not only the line’s great tradition, but also in its great attention to detail when it comes to service. As well, Hapag-Lloyd Cruises is one of the last lines to sell drinks at real duty-free prices and not the landside hotel prices that have been adopted by all other lines except the all-inclusive ones. Hapag-Lloyd Cruises offer Relaxed Luxury. For further information and competitive Sterling fares for any Hapag-Lloyd cruise please call Gay Scruton at The Cruise People Ltd in London or e-mail cruise@cruisepeople.co.uk. Hapag-Lloyd Cruises has decided to unify the colours carried by all members of its fleet. 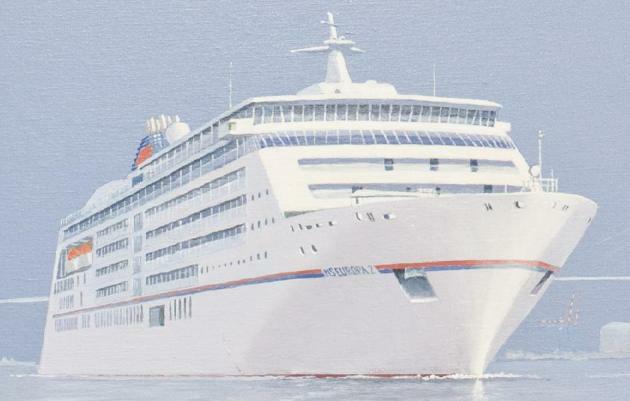 After a 13-day stay at Hamburg’s famous Blohm & Voss shipyard, the Hanseatic has re-appeared in Hapag-Lloyd Cruises’ distinctive colours, an orange and blue band, as well as the orange funnel with the cruise line logo. Her comprehensive drydocking included more than 780 items, among them, the renovation and modernisation of two decks of cabins, the buffet restaurant, and the sauna and pool area. The ship returned to service today. “With the charter contract for the Hanseatic extended until 2018, we opted to add the visual unification of the fleet. Nevertheless, the legendary former logo of the Hanseatic will be retained as a product logo on board“, said Sebastian Ahrens, Managing Director of Hapag-Lloyd Cruises. 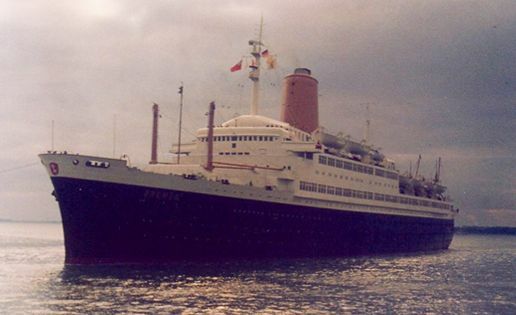 Until now, the expedition ship Hanseatic had carried the colours of the former North Atlantic liner of the same name, which had operated for the German Atlantic Line. More than 400 shipyard workers in three shifts carried out the modernisation, which included substantial renovation of cabins on Decks 5 and 6. Plenty of wood, new fabrics, furniture and carpeting help to create a warm atmosphere, and now present a contemporary design for the Hanseatic . The Columbus Lounge buffet restaurant also features a new color design and has been renamed the “Bistro Lemaire.” Further items included the modernisation of the pool and sauna, with a new steam sauna, as well as a multi-mode shower. More than 11,482 sq ft of carpet, 621 gallons of paint and 3,937 sq ft of fabric were used in these renovations. New service options now available on the Hanseatic include worldwide mobile telephone reception via OnAir, Wi-Fi in all cabins, an extended selection of international newspapers in full editions, as well as headsets for passengers during the excursions for better clarity for the experts to be heard. 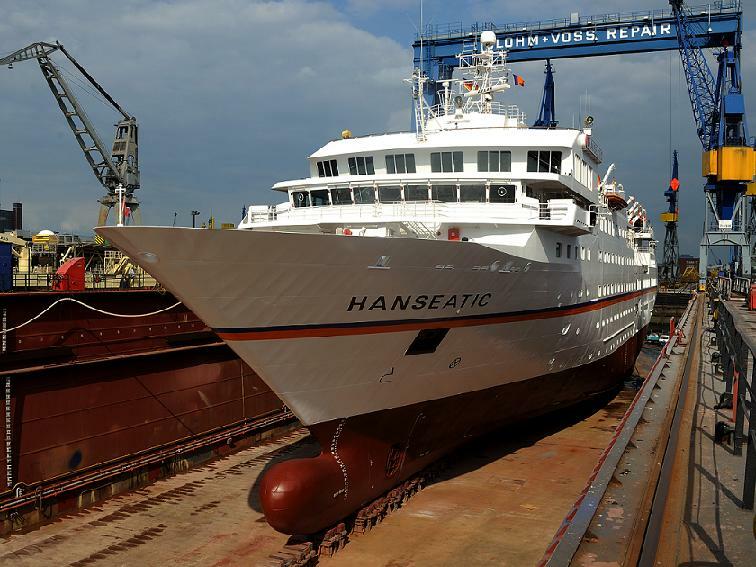 Shining in her new splendour, the Hanseatic set sail today on a four-day cruise from Hamburg via List (Sylt) and Binz (Ruegen) to Travemuende on the Baltic. For the first time ever, Hapag-Lloyd Cruises will offer guests the opportunity to discover the fascination of the Arctic and the Northwest Passage on a shorter, 19-day cruise with MS Hanseatic. Sailing through a portion of the Northwest Passage, guests will follow the tracks of Amundsen and Franklin and explore the ice coast of Greenland as well as the untouched island world in the north of Canada. The short itinerary departs from Kangerlussuaq in Greenland on August 14, 2011, and ends in Reykjavik, Iceland, on September 2nd. Guests will experience the heavenly and exotic island world between the Seychelles, Madagascar and Mauritius onboard the Hanseatic in November/December 2011, with a new stop in Nosy Lakandava in Madagascar. This 14-day itinerary departs from Victoria, Mahe, on November 22, 2011, and ends in Port Louis, Mauritius, on December 5th. MS Hanseatic, Hapag-Lloyd Cruises’ small and beautifully-appointed ship, rated the world’s only 5-star expedition ship by the Berlitz Complete Guide to Cruise Ships & Cruising, was designed to provide intensive exploration in the most elegant surroundings for a maximum of 184 passengers. The Hanseatic is known worldwide for her unsurpassed ability to navigate and explore the difficult waters of the Arctic and Antarctic, with the highest ice class for passenger vessels, E4. The Hanseatic cruises the world year round, landing in unusual and remote destinations. A shallow draft and high manoeuvrability allow the ship to enter waters larger cruise vessels cannot reach. For further photos and details of this latest modernisation please click here. For bookings, enquiries or to request a brochure, please call Gay Scruton at The Cruise People Ltd in London on 020 7723 2450 or e-mail cruise@cruisepeople.co.uk.